Sage Gautama and his beautiful wife, Ahilya, lived in an ashram. The other sages' wives hated Ahilya. They asked their husbands to get Gautama and Ahilya to leave the ashram. The saints performed a tapasya to please Ganesha. When he appeared they asked him to help them get Gautama out. Ganesha became a cow and started grazing in Gautama's fields. 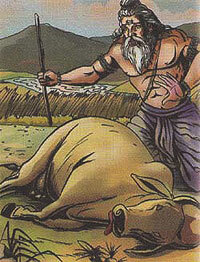 Gautama hit the cow with a small stick. But with a light blow, it dies. All the sages called Gautama a sinner; they asked him to leave the ashram. Sadly, he left with his wife. He prayed to Shiva for forgiveness. Shiva appeared before him and told him the truth. At first, Gautama wanted to punish the sages for their misdeed, but he forgave them as it was because of them that he could see Shiva. He asked Shiva to stay there forever. Shiva consented, and became the Trayambakeshwar Jyotirling.